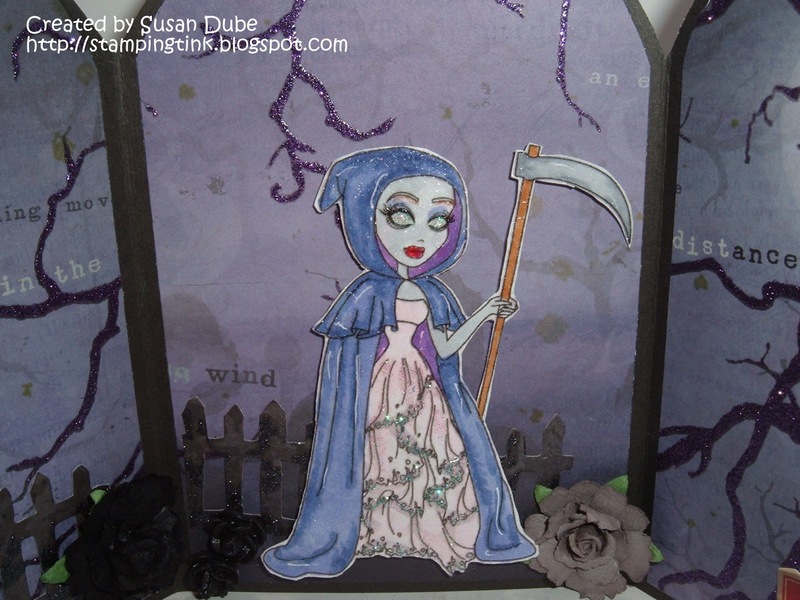 Stamping Tink: The Grimm Reaper - Sassy Studio Design Mini Release Halloween Blog Hop! 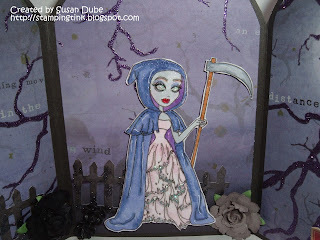 The Grimm Reaper - Sassy Studio Design Mini Release Halloween Blog Hop! 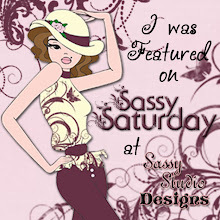 Welcome to day 2 of Sassy Studio Designs's Mini Release Halloween Blog Hop! If you didn't blog hop yesterday, boy, did you miss out! 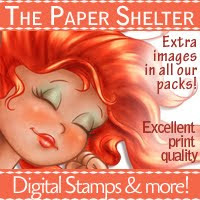 Makes sure that you take the time to go back and see all my uber talented design team sisters fabulous work! 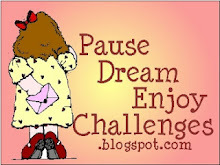 If you came to my blog from Regan's spectacular blog, then you're on the right track. 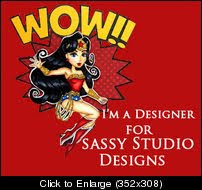 If not, head over to the Sassy Studio Design's blog and start things off right! I don't want you to miss a thing! 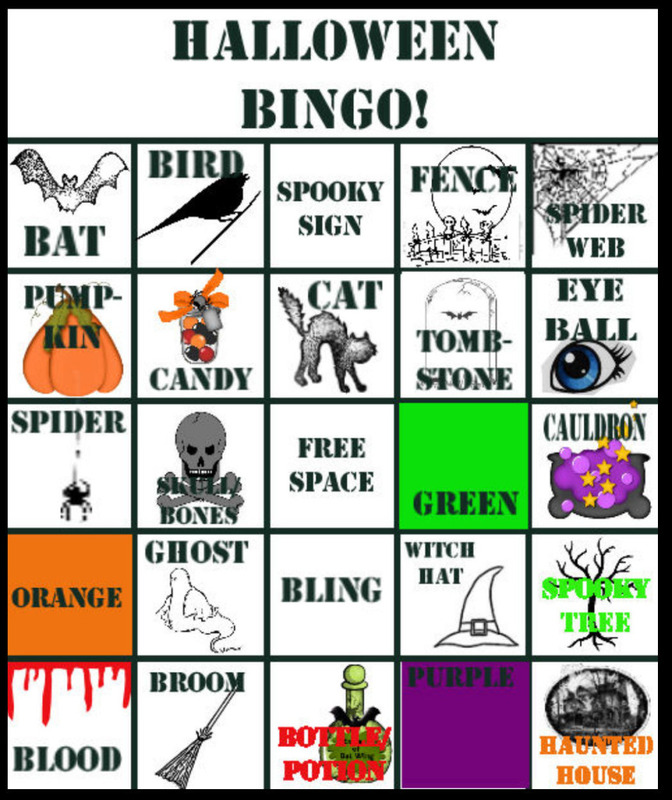 The oh so inspiring Kim came up with a fun game of Bingo for us to do! Here's the card and doesn't it look like a blast to do? 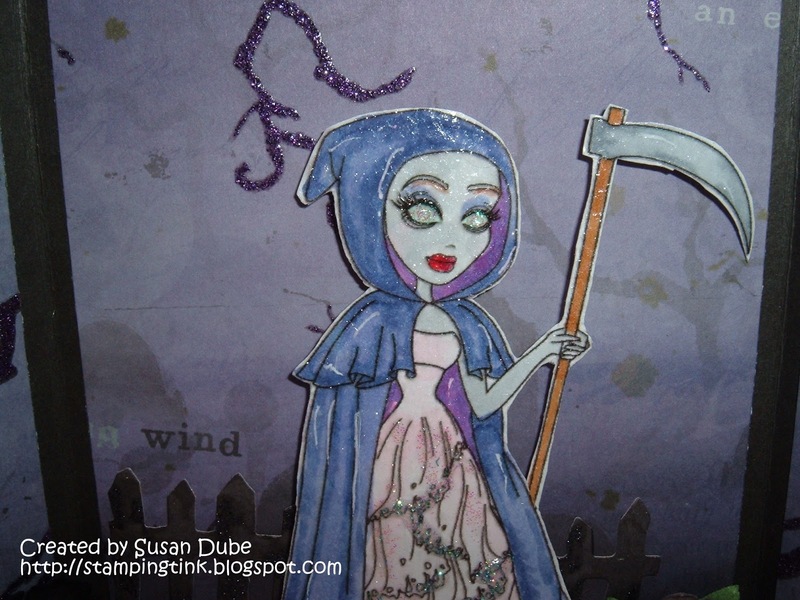 I colored her with copics and Spectrum Noir markers and added some stickles (yep, even Grimm's have to sparkle too! ), to her dress and eyes. They don't show up very well in the photo but they're pretty scary! The papers are from K&Company's Halloween paper and the flowers are from Recollections. 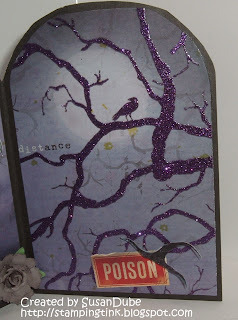 I love this fence from Tim Holtz. It's so scary and rickety looking! I just thought the black and grey flowers were perfect! Here's a close up of her. I used some Goosebumps (appropriate don't you thing?!) all over her and that's what gives her hood such a shine. The texture that stuff gives your image is out of this world! It's the first time I've used it and I love it! Isn't she just beautiful? I think she looks very haunting. This is the first panel and you can get a better view of the fence here. This is the left side inside panel with the bat and the moon. Love it! Here is a better picture of this gorgeous creature going off to help someone meet their maker - or her! I absolutely love this bird! The paper pack had this great, dark paper with this gorgeous purple bling all over the branches. You know I've got to love that paper with bling! Susan, great job!! Love the tri-fold and you've colored this image beautifully!!!!!! WOW!!!! Susan this is absolutely Fabulous!!! mmmmm, love your papers perfect for such a lovely grim reaper!!! She is gorgeous with the texture and bling!!! This is so pretty, Susan!! I just love the dp you used, and your coloring is fabulous! Very spooky. 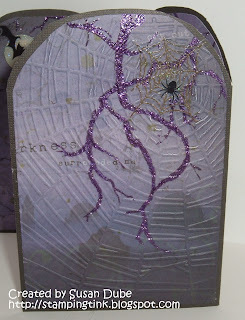 Great card Susan, and the texture is awesome, I love the spider web. Wow-this is totally cool-love all of the details! This is just wonderful - you did an incredible job....you have evoked a really creepy feeling with this fantastic tryptych - congratulations! Susan, this is fabulous! I love your tri-fold card shaped like a tombstone...so creative! Great coloring and love the background scene you created. Love it! 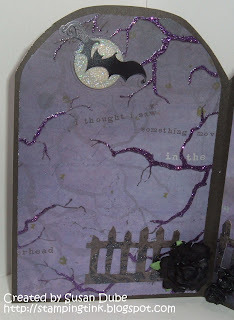 Love your tombstone card and all the extras in it. Subtle, but beautiful. And she is so beautifully creepy! 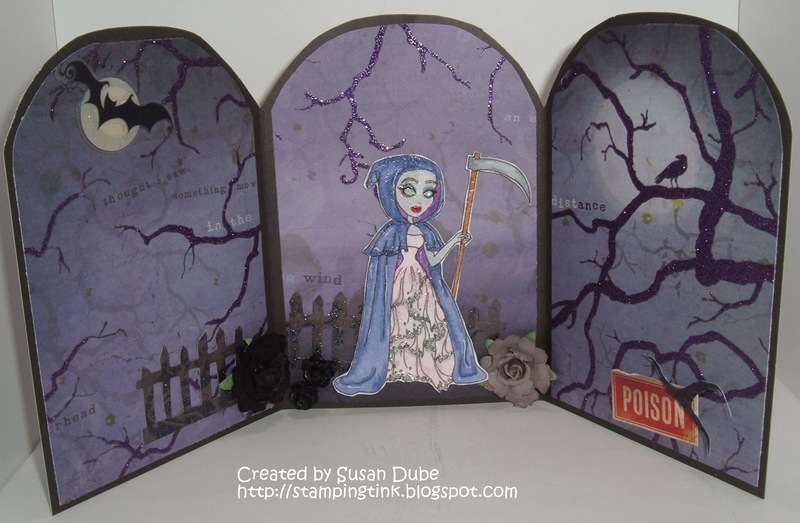 Your trifold card looks amazing Susan. Your image is colored in so Beautifully. wow Susan, this is amazing! so cool, love it! Fabulous card, lovin' all the sparkle! this is so creepy cool I love it! Rina, Love your card and how it opens. Great scene! Sorry Susan I meant to write your name but it came out Rina instead. Senior moment I guess. So cute! 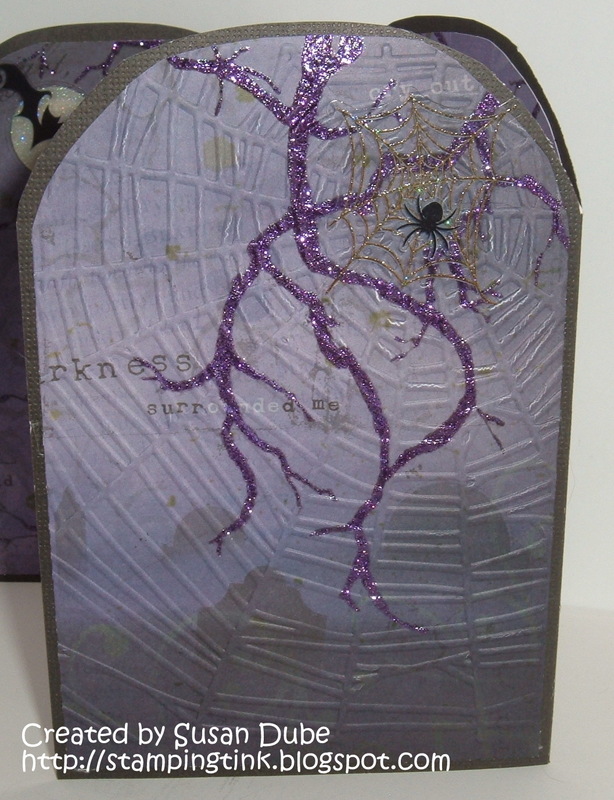 I love that stamp, love the three panel tombstones and the spider web embossing. Great work. Stunning, Susan! 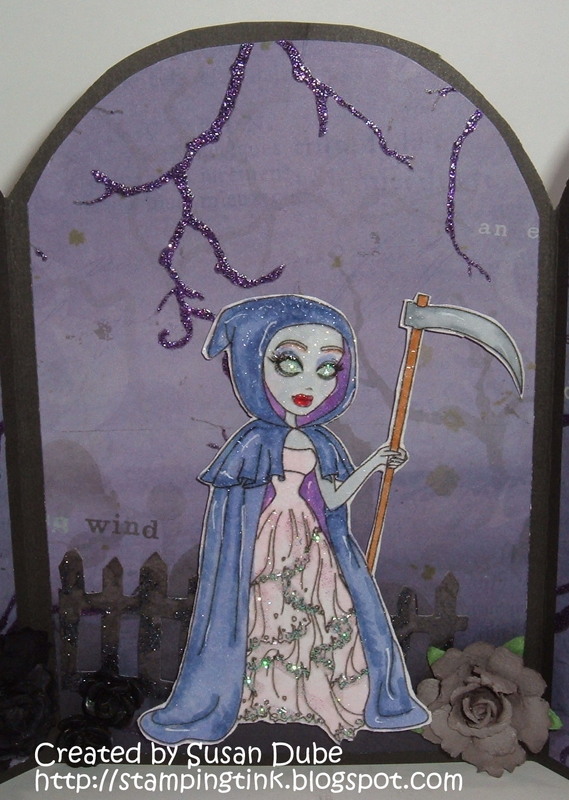 LOVE that paper as a background for the Reaper! Fabulous details too! The embossing on the panels is a terrific touch! Love this card! Great idea to make a tombstone shaped trifold. Intereting texture. I've never tried goosebumps and now I may have to. OH. MY. WORD!!! That is just too incredible for words girlfriend!!! WOWZERS!!!! I love the shape of this! Fabulous card, so many little details! Perfectly spooky! Your card is amazing! I love it:) Loved the way you colored her in, she sure does look spooktacular! Wow! This is just amazing! I love the details you added. It's all so spooky and fun! Great job! Such a cool card Susan. 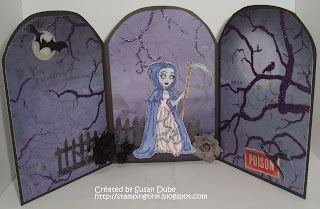 Love the trifold, and cool tombstone shape. Love the shimmer on her, too. 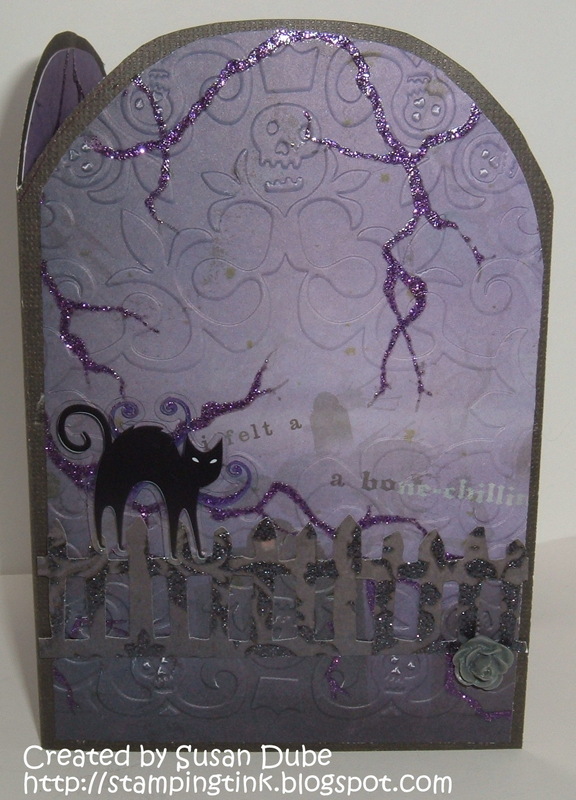 That is one awesome Halloween card. Your coloring is outstanding.